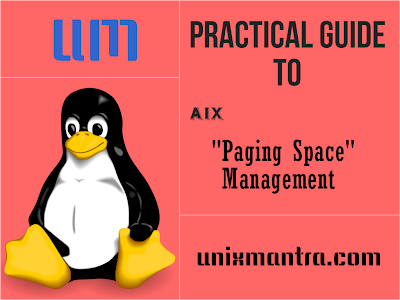 Home » AIX , LVM » Practical Guide To AIX "Paging Space Management"
In this article we are going to discuss about , how to manage paging in AIX OS. To add paging space we need to use "mkps" command. Equivalent smitty faspath command is "smitty mkps". There will be an entry added in "/etc/swapspaces" file when you create a paging space if you mention optiion "-a". These are "man lsps options"
-a Specifies that the paging space is configured at subsequent restarts. -c Specifies the size of the checksum to use for the paging space, in bits. Valid options are 0 (checksum disabled), 8, 16 and 32. If -c is not specified it will default to 0. -n Activates the paging space immediately. -s LogicalPartitions Specifies the size of the paging space and the logical volume to be made in logical partitions. Specifies that a paging space of type logical volume should be created on the system. Specifies that a paging space of type NFS should be created on the system. Name of the helper program for a third party device. Name of the device entry for paging space. The lsps command displays the characteristics of paging spaces, such as the paging space name, physical volume name, volume group name, size, percentage of the paging space used, whether the space is active or inactive, and whether the paging space is set to automatic. Equivalent smitty faspath command is "smitty lsps". The following examples show the use of lsps command with various flags to obtain the paging space information. The -c flag will display the information in colon format and paging space size in physical partitions. You can change only the following two attributes for a paging space logical volume. shrinkps: Temporary paging space paging00 created. shrinkps: Dump device moved to temporary paging space. shrinkps: Paging space hd6 removed. shrinkps: Paging space hd6 recreated with new size. check the lslv command output. Note:You should not shrink the paging beyond the system requirement to avoid system crash. All devices present in the /etc/swapspaces file are now available. The /dev/paging03 and /dev/paging04 devices are now available. Inorder to make the paging space active , you need to use "swapoff" command. The rmps command removes an inactive paging space, means whenever you need to remove a paging space you should make it inactive by using "swapoff". This removes the PS01 paging space.